Snowfall Academy: Getting Started with Ambleside Year One: Is it Enough? Getting Started with Ambleside Year One: Is it Enough? Well friends, here we are. We started this journey together way back in February (that long ago? Yes, my friends, that long ago.) Here we are in the heat of summer and finally wrapping things up. I hope that those of you still following along have found some little bit of encouragement in what I have written here, and that I have succeeded at least a little in helping you to feel like you CAN do this. Because you can, Mama. You've got this. For our last coffee chat today (okay if we make that an iced coffee?! ), I'd like to offer some thoughts in answer to the question is it enough? Are good books, oral narration, and copywork enough for language arts for my Year One student? Don't we need spelling and composition curricula too? Is nature study enough for science? Oughtn't I get a science textbook with experiments and throw that in there too? Is it enough to listen to the music during composer study and look at the paintings during picture study? Shouldn't we try to read biographies and find out about the style of the artists and correlate it all with history? We finished all our lessons for the day in 2 hours! Is that really enough? I hear these questions asked by those new to Charlotte Mason's ideas frequently. I asked them myself as a newbie getting my toes wet in Year One for the first time. We look around at what our young students – Kindergarteners, First and Second Graders – are doing in the school system, and think that we aren't possibly doing enough. But guess what Mama: relax. Yes. It is enough. Think about it this way: Charlotte Mason tells us that education is the science of relations, and that the ultimate goal is not how much a child knows but how much he cares. Our goal is to help our students develop relationships with a wide variety of ideas, to help them understand how all of the pieces fit together, and to keep alive their thirst for more. This is true across the board, but it is especially true for our youngest students in the early years of their formal education. So, composer and picture study - especially in the younger years - isn't meant to be a music (or art) history course. It IS one of those things that they are supposed to make their own connections with. Spending a longer period of time with a certain set of pieces (or paintings) from a specific composer/artist really does help them to develop a relationship with it, and I have found that it does kind of stick with them. It takes a while to see it though. [Michelle] is what - 10 now? We've probably done this style of composer study on 9 or 10 different composers over the past 4 years, and she has made connections like "Handel sounds an awful lot like Bach, mom, did they live around the same time?" (Why yes, my child, they did as a matter of fact...) We've found the same to be true with artist study. Over time - given time to really make a relationship with the artist - they start noticing similarities in style between different artists. And it's THEIR discovery. I know there is an art history book scheduled in the upper years of AO, and with the foundation of familiarity with a variety of artists from a variety of periods, that's going to be a whole lot more meaningful when they get to it and put a name to the different styles and eras, etc.. I think the same holds true for music study. One thing I've come to realize is that Charlotte Mason education is sort of a departure from other forms of education in that it is more of a whole-to-parts approach rather than the other way around. We let them know and wonder and delight in things in their younger years - and later on get into the more technical nitty-gritty analytical kind of information. (The same idea behind nature study being the best 'science' for the younger years, because it lays the foundation for higher level science study in the upper years.) So that's really what we're trying to do here. Also - there is a CM quote I love and was reminded of at the recent conference - something along the lines of it is not so much what a child knows, but how much he cares. It matters more that he loves music than knows all the things about it. We are educating for a rich-and-full life and for kids who will leave high school with a thirst to continue to learn for the rest of their lives. We don't necessarily need to cram everything in to those 12 years we have for them at home. And if we don't have to try to cram everything in to the 12 years that we have with them at home, we *really* don't have to try to cram it all in to Year One. "...it is more of a whole-to-parts approach rather than the other way around. We let them know and wonder and delight in things in their younger years - and later on get into the more technical nitty-gritty analytical kind of information." Beautifully said, Jen! And I would add that when they get to those details, they CARE, because they already know and love the subject. The problem with education is rarely that we don't have enough information for students, but rather that they don't care enough to take it in. Thanks for another great post! 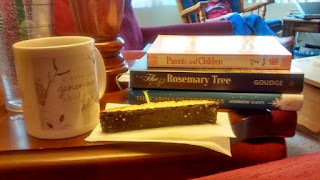 I have many favourite parts of homeschooling the CM way, but the connections they make is one of my very favourites. I'm just thinking of the time my 5-year-old heard me read the story of Stephen in the Bible, and then ran and found the picture by Rembrandt in a book. He had quietly sat and looked at the picture some time previously, and recognized the story instantly when I read it. These moments don't come every day or every week, but they do come because we consistently spend just a little bit of time every day and every week forming relationships with things and with art and with the people of history. It's so much fun when they start making those connections, isn't it? And I really like what you said about the whole to parts aspect too. I'm really enjoying watching that play out in our home. I've loved these!! Thank you so much for this series! We're just starting AO year 1 with my oldest so it's been perfect timing for me!! Thank you for all your thought and encouragement! It is a huge help to us newbies. Thank you for sharing your words of wisdom.